REDSTONE ARSENAL, Ala. — When it comes to the families of fallen Soldiers, the Army is standing up to a responsibility to watch over these survivors of war’s devastation as long as support is needed. That’s no different at Redstone Arsenal, where recent staff and facility additions will make a difference in the level of support Army Community Service can provide family members coping with their loss while hoping for a better future. Locally, the ACS program – known Armywide as Survivor Outreach Services or SOS – is headed by someone whose heart has experienced its own loss of a beloved Soldier. The coordinator is Emily McFall, the widow of Staff Sgt. Tom McFall, who died in Iraq in 2007 from wounds sustained from an improvised explosive device detonated during a dismounted patrol. It is a job McFall cherishes because of what it stands for – the Army wrapping its arms around family members living with their loss and providing them with the support they need to go on with their lives, the chance for her to personally affect positive change in the lives of mourning families, and the ability to provide these families with a safe haven to work out their issues and face their challenges. "We want to give them a place where they can share their stories," McFall said of the surviving families. "We want to give them a place where they know they are accepted and they know they will be understood. This is a place where they can relate to others who know what they are going through. This is very rewarding to me. I need to put my efforts into something like this that allows me to reach out to other families." McFall is unique to the Army’s SOS program because of her own experience with the loss of her Soldier husband. Most of the Army’s SOS coordinators are program or human resource managers or counselors who haven’t experienced a direct loss. McFall’s experience brings a personal perspective to Redstone’s SOS program while also relying on her management skills as a former Soldier to build the program. "This is about helping widows and widowers, and their children and their extended families find a group that will support them through all the things that happen when you lose your Soldier. This is about giving them a place where people aren’t scared to talk to them," McFall said. She has experienced that fear. She has seen it in the eyes of other military wives who worry about losing their own husbands to war. And, surprisingly, she has seen that fear in the eyes of some of the new friends she has made in Hartselle since moving there a few years ago. "I am their worst nightmare. I represent someone they could be," McFall said. "There was one lady at my church who was not very nice to me and seemed distant. I finally asked her what the problem was. She told me her husband is a police officer and said ‘You are my greatest fear.’ So, even in this new place that is not attached to a large Soldier base, I can be someone’s nightmare. It was sort of eye opening." Survivor Outreach Services is a joint effort between the Installation Management Command and its Family and Morale Welfare and Recreation and Army Community Service, and the Human Resources Command’s Casualty and Mortuary Affairs Operation Center. It is represented at all major Army installations and at some smaller installations. Nationally, it can be reached through the Army OneSource website at myarmyonesource.com (select Family Programs, then Surviving Families). Locally, SOS can be reached by calling 876-5397. The Redstone SOS program provides assistance to families in Madison, Morgan, Limestone, Lauderdale, Marshall, Jackson, Cullman, Franklin, Lawrence, DeKalb and Colbert counties, but also reaches into other counties that are closer to Redstone than the sister SOS program at Fort Rucker. In late August or early September, ACS will open its SOS headquarters facility, attached to its building on Redeye Road. It is hoped this facility will become a second home to surviving family members who need access to support, information and services, who want to belong to survivor support groups and who want opportunities to bring their family together with other survivor families. In a way, McFall’s association as the local SOS coordinator stems from a support group started in 2008 at Bicentennial Chapel. The survivor group – known as My Soldier, My Fallen Hero – still comes together on Tuesday mornings at 10 a.m. to talk about their experiences and to lend support to each other. The group was started by three widows: McFall, Tiffany Little and Jenna Henderson. "We know there are 22 other widows out there who may want our support. We suspect there are even more in our area," McFall said. "We want to reach out to these widows and their families. We want them to know we are here when they want our support." Reaching out to these families is tough. Some don’t want to be found. Some don’t want to talk about their loss. Some don’t want to be associated with a survivor group or with the military. The point is not to force these survivors, but to be there when those "don’ts" turn into "wants" and "have tos." "Everybody grieves in their own way and in their own time," McFall said. "We want to make sure they know about us when they do need us." McFall has seen that within her own children – Austin, now a rising college student; Elizabeth, a fifth-grader; and Matthew, a first-grader. "They are happy. But I can see the hurt in their eyes when other dads are around or when we are with other military families. They want to do things with their dad – they want to wrestle with him and be with him. We are blessed, though, because we know families and Soldiers who do try to help them and be there for them." McFall talks with her children a lot about their dad. She stays in contact with her in-laws. She likes to talk about Tom McFall to anyone who wants to hear about him. "I try to reinforce the memories with my kids. I want to keep him alive," said McFall, who met Tom McFall when they both served in the Army. "In our society, it’s sort of taboo to talk about the deceased. But I love talking about him. I still want people to know about him and to know who he was, and about the kind of things he did and even the dumb things he did. He was a great person and I want others to know about him. That keeps him alive for me. The more I talk about him, the better it is for me." The McFall family also remembers their beloved Soldier in other ways. The initials mTm – for Thomas Michael McFall – are now tattooed to the inside of McFall’s right wrist. Her son Austin has also gotten a tattoo – an eagle on the back of his shoulder – to remind him of his dad. Besides growing their widow support group, McFall would also like to see SOS offer support groups for siblings and other family members. The SOS headquarters will have a Hall of Remembrance, a play area for children, an office for meetings and support counseling, and a comfortable living area for hanging out and relaxing, and for group meetings. Social events for surviving families are being planned for the next year as the SOS program ramps up, with a ribbon cutting and open house set for the SOS facility opening, and a family picnic set for late September at the Col. Carroll Hudson Recreation Area. Anyone wanting to donate materials and supplies for the SOS headquarters can call ACS at 876-5397. The SOS program is sending out letters to surviving families telling them about its services and activities. Letters about SOS are also being sent to churches in the 11 county area. "We are hoping surviving families will join us," McFall said. "They are usually hesitant about that. When we contact them they ask us things like ‘What do you want from me?’ and ‘Why haven’t you been here sooner?’ They can be anxious about their association with us. Some go all the way back to 2001 and they are done with the grieving, they’ve worked to put it all away and they don’t want to revisit it. So, all we can do is make them aware of the program and then hope they will contact us when they need support. "Our door is open to these families. Now we’ve got to get the word out so they know about us." Question by : Outreach Programs Questions….? Does anyone know how long it typically takes to get money from an outreach program. Like, If you go there, say you need money, do you get it that day? Or how does the whole process work. Please help. Thank you! If you go to a church they will help you today, if you are so inclined. I have not heard of any other outreach programs. Posted by admin. Categories: Church Outreach. Tags: outreach, Programs, Questions. Comments Off on Outreach Programs Questions….? http://natcrawford.blogspot.com – global outreach – missions – website. 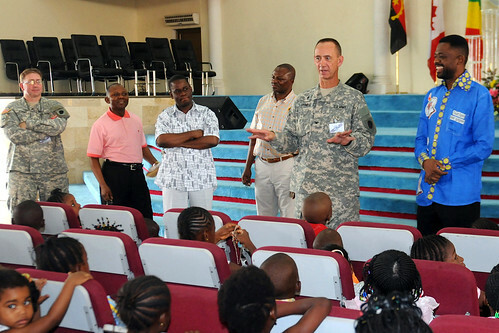 Illinois National Guard Chaplain (Col.) Daniel Krumrei speaks to children of the Centre Evangelique La Resurrection church in Kinshas, Democratic Republic of Congo, Sept. 11. Krumrei and Sgt. 1st Class David Penny made a visit of goodwill to the church as part of MEDFLAG 10, a joint medical exercise aimed at providing humanitarian assistance to the local people. U.S. Army photo by Staff Sgt. Kassidy L Snyder. Three and a half years to build; more than 6,000 members; completely debt free — a church is built by the people for the people. “This church is the fruit of the sacrifices of our people,” said Guy-Roger Dang, associate pastor at Centre Evangelique La Resurrection in Kinshasa, Democratic Republic of Congo. The two-story church standing in the middle of Kinshasa will celebrate the one-year anniversary of its opening in December. Illinois National Guard Chaplain (Col.) Daniel Krumrei, along with chaplain assistant Sgt. 1st Class David Penny, were welcomed by the pastor and his congregation as they made a visit of goodwill. “We are very happy and encouraged to see people of other countries come to visit our church,” said Dang. The church proudly displays multiple flags on its altar to signify the different countries of its visitors. Krumrei of Springfield, Ill., and Penny of Buckley, Ill., are in Africa with MEDFLAG 10, a joint medical exercise aimed at providing humanitarian assistance to the Congolese people. The chaplain and his assistant’s primary mission is to take care of service members involved in the exercise, both personally and spiritually. In addition to supporting U.S. service members, the ministry team is engaging with chaplains of the Armed Forces of Democratic Republic of Congo (FARDC). “Our Congolese counterparts showed special interests in discussing areas of trauma, family care and post-traumatic stress,” Krumrei said. The Illinois National Guard ministry team is conducting a three-day workshop with FARDC chaplains, aimed at bringing peace within the country and to the people, he said. This is the first visit to Africa for the ministry team; however, the mission is a familiar one. Krumrei has been a chaplain for more than 25 years and visited ,many countries. “Each mission is a privilege, and it is important to understand our similarities and differences so we can work together to accomplish the overall mission,” Krumrei said.